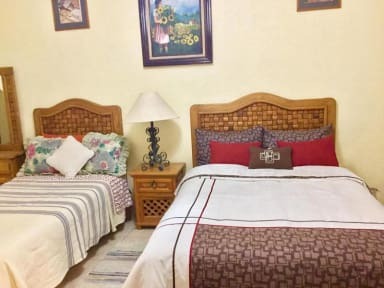 The Meson De La Luna is a lodging within a property with rooms that go for two people and up to 4 people, all rooms have private bathrooms, cable TV, in addition to Netflix and YouTube on the screens. our staff is friendly and all the time we try to make the guests feel contracts in privacy, the lodging is located 4 blocks from the center of Tepoztlan Morelos where they can eat typical foods and climb the Tepozteco pyramid since it is an attraction more than Tepoztlan. The Meson De La Luna is a property where we try to keep things in order to receive our visitors with the greatest comfort in our rooms that you find in constant renovation to keep them always impeccable and in good condition. We do not have parking. 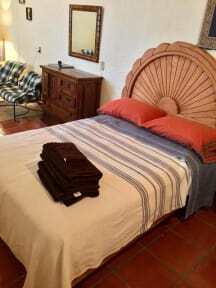 The Meson De La Luna is located in the beautiful town of Tepoztlan Morelos, Mexico. The 'Piramide del Tepozteco' is located between the mountains. The market that is only 5 minutes away on foot where you can find typical foods of the region. All the rooms of the 'Hospedaje El Meson De La Luna' are private, private bathroom with hot water, Smart TV of 40 'with the services of Satellite TV, Netflix and YouTube included. In addition, we have several common areas where the guests and travellers can get together and exchange past experiences and future plans. Check in from 15:00 to 19:00. Check out from 11:00 to 12:00.